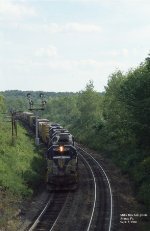 Description: D&H GP39-2 #7417,7614, GP38-2 #7321, GP39-2 #7416 & 7410 on RW-6 southbound north of Simpson, Pa. Description: D&H RS-3m #501, GP39-2 #7420, GP38-2 #7321 & GP 39-2 #7406 and another 7600 series GP39-2 on CX-1 rolling northbound along Stillwater Dam north of Forest City, Pa. Description: D&H GP39-2 #7608, 7417, GP38-2 #7319 & GP39-2 #7419 on NE-84 making a pick-up in Carbondale yd. Description: D&H GP39-2 #7410, U33C #761, U30C #709 & GP39-2 #7612 southbound at Pike St. X-ing, Carbondale, Pa. Description: D&H GP39-2 #7419 & 7604 on WR-1 northbound through Simpson, Pa. Description: D&H GP39-2 #7603 & 7617 pushing WR-1 northbound under the PA route 171 viaduct at WC Cabin, Simpson, Pa. Description: D&H GP38-2 #7316 and C420 #409, 2 former LV units, pushing WR-2 northbound at UD Cabin, Uniondale, Pa. Description: D&H U30C #703, 710 & 707 on AM-2 passing through Green Ridge yd. Description: D&H RS-3m #507 with welded rail train in Carbondale yard. Description: D&H GP38-2 #7322, U23B #2313 & U30C #705 on NE-84 northbound through Simpson, Pa. behind Doyle & Roth buildings. Description: D&H GP39-2 #7401 leading RW-6 southbound at LS Cabin, Lanesboro, Pa. Description: D&H wrecking crane #30021 cleaning up derailment at Windsor, NY on old Penn Div. Description: D&H GP39-2 #7610 & U33C #754 side-by-side in Oneonta yd. Description: D&H GP39-2 #7611, 7411, U23B #2312 and another 7600-series GP39-2 on AM-2 northbound north of Forest City, Pa. near Stillwater Dam. Description: D&H Hudson Pushers (GP39-2 #7414, 7617 & 7419) pushing AM-2 northbound north of Forest City near Stillwater Dam. Description: D&H GP39-2 #7414, 7618 & 7406 on WR-2 northbound above Forest City, Pa. about to duct under PA route 171. Description: D&H GP39-2 #7614 with flanger extra southbound at FT Cabin, Forest City, Pa. Description: D&H GP38-2 #7325 & U33C #757 pushing WR-2 northbound at Childs, Pa., south of Pike St., Carbondale. 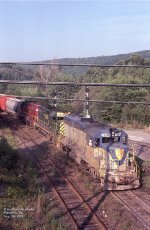 Description: D&H GP39-2 #7414, U33C #761 & 754 on WR-7 northbound at FT Cabin, Forest City, Pa. 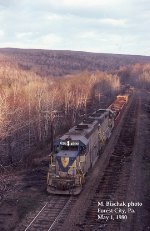 Description: D&H GP39-2 #7606, 7406 & GP38-2 #7322 rolling southward at WC Cabin, Simpson, Pa. Description: Sperry Rail Service detetor car #123 on D&H in Carbondale yd. Description: SRS detector car #123 on D&H in Carbondale yd. Description: D&H SX yard office at Hudson yd. Hudson Operator also worked out of the this office controlling south end of CTC from wilkes-Barre to Dundaff St. Carbondale, Pa. Description: D&H U23B #2313, GP39-2 #7606 & 7402 pushing WR-7 northbound along Stillwater Dam north of Forest City, Pa. Description: D&H GP39-2 #7612 & 7618 on BS-1 northbound at Forest City about to pass under PA Rt. 247 bridge. Description: D&H GP39-2 #7613, RS-3m #508, GP38-2 #7315, RS-11 #5007 & C420 #404 on NE-87 near MF Cabin, Mayfield, Pa. Powderly siding is to the right. Description: N&W GP9 #3486 along with D&H C420 #409, 404 & U23B #2305 northbound through Simpson, Pa. at WC Cabin. Description: D&H C424m #463, 461 & 462 at Bevier St. yd. Description: D&H GP39-2 #7620, GP38-2 #7325, 7316 & GP 39-2 #7613 on RW-6 about the crest the summit at Ararat, Pa. Description: D&H GP39-2 #7605, GP38-2 #7319, 7314 & GP39-2 #7419 on WR-7 northbound at Ararat, Pa. Description: D&H RS-3m #508 & GP39-2 #7408 pushing WR-7 northbound at Ararat, Pa. Description: D&H C424m #461, RS-3m #508, U23B #2308, U33C #754, GP38-2 #7321 & GP39-2 #7407 on NE-87 southbound at Carbondale, Pa. just south of Pike St. crossing, passing Vis-Queen. Description: N&W GP9 #640, GP30 #528, GP38 #4101 & GP7 #2405 on BM-2 in D&H E. Binghamton yd. Description: D&H C420 #405, U23B #2311 & GP39-2 #7406 on BS-1 coming into E. Bnghamton yd. at Terrace Dr. Description: D&H C424m #456 along with 461 & RS-11 #5001 pushing WR-7 northbound at BS Cabin, Linden St. Scranton, Pa. Description: D&H GP39-2 #7607 on P-5 local switching Taylor yd. Description: D&H C424m #452, C420 #415 & 406 on NE-87 changing crews at Taylor yd. Description: D&H GP39-2 #7613 on point of RW-6 holding on the main while WR-7 with caboose #35816 passes through the yard. Description: D&H U33C #761 & 755 with other units at E. Binghamton yd. Description: NYS&W C420 #2000 & 2002 with Lackawanna Railroad Excursion at Prospect Ave. crossovers, Binghamton, NY ready to north. Description: NYS&W C420 #2000 & 2002 with Lackawanna Railroad Excursion rolling over the Chenango River. Description: D&H GP39-2 #7618, 7409, 7417 & 7415 on RW-6 passing through Taylor yd. Description: CR GP10 #7551 along with SW8 #8676 & SW8m #8666 and others on tie-up tracks at Coxton yd.